baby trophy, gag gifts, individual or team sports and more! Our commemorative baseballs and softballs make great gifts for coaches, team moms and MVPs. Jumbo balls feature plenty of room for autographs from your favorite players, or can signed by team members and used as keepsakes and gifts for coaches, team moms and players. 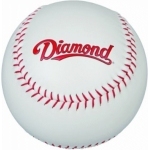 We also offer an affordable Little League practice ball. All 9" baseballs and 12" softballs can be displayed with our Ball Holder Trophies & Displays. Don't see exactly what you need? We Can Build It! We have access to thousands of trophy parts including figures, bases, risers, plaques, ribbons, medals and more. Contact Us with your trophy and award needs and we'll get back to you promptly with a quote.